Africa is home to almost half of the world’s uncultivated land fit for growing food crops—an estimated 202 million hectares—but much of it is off limits to farmers because it is difficult to farm or it is used for other purposes. In many areas erratic rainfall, poor soil fertility, and a lack of infrastructure and support services offer limited prospects and few incentives for poor farmers to invest in boosting productivity. Comparing and contrasting where the challenges to and opportunities for growth in productivity are located, and doing so at multiple scales and over time, can give us powerful insights that can enrich our understanding of the variables that affect agricultural productivity. 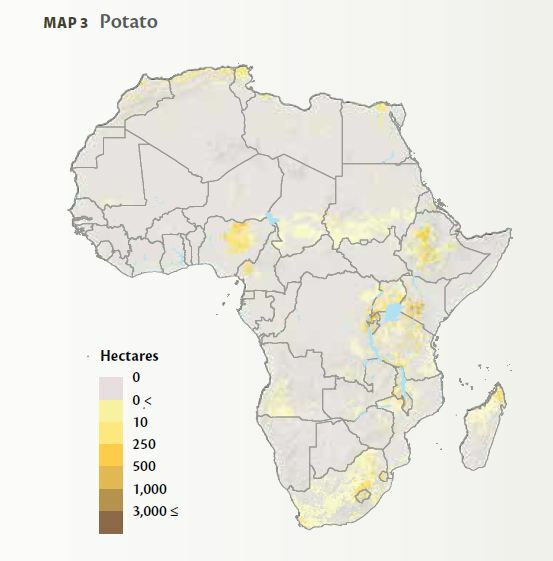 The Atlas of African Agriculture Research & Development presents a broad range of geospatial data that relate to strategic agriculture policy, investment, and planning issues. The maps and analyses helps in understanding the role of agriculture in Africa, and new ways to boost agricultural performance. A better understanding of the current and evolving conditions and how to increase productivity despite obstacles. Populations within the same farming system share similar farming practices and livelihood strategies. 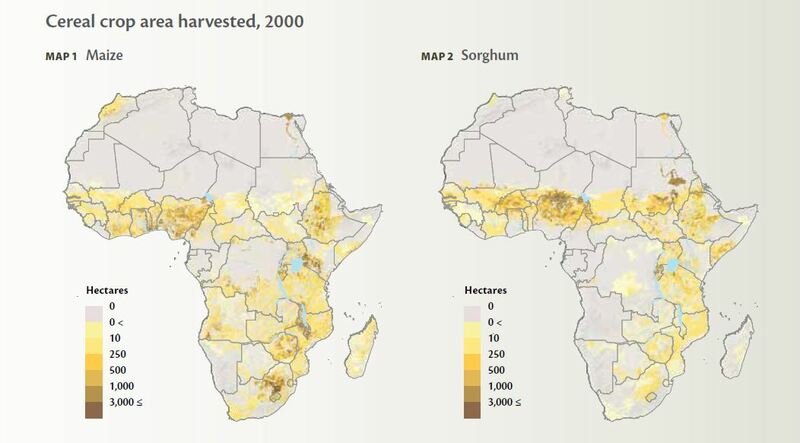 As the map shows, many farming systems in Africa exhibit a strong geographical pattern, extending across northern Africa and Africa south of the Sahara (SSA), reflecting a mix of factors, including climate, soils, and markets. In SSA, 16% of land area is dominated by the maize mixed farming system, mostly in the eastern, central, and southern regions. Broadly similar farming systems share recognizable livelihood patterns and similar development pathways, infrastruc­ture, and policy needs. This classification can help policy­makers and scientists target institutional innovations and technologies to specific farming systems, thereby focusing planning, policies, and research. In this respect, high poten­tial farming systems with good market access might benefit most from improved maize, cowpeas, and dairy, while drier areas might benefit from improved sorghum, millet, and live­stock, because these contrasting farming systems offer differ­ent ways to improve livelihoods. Data source: Ramankutty et al. 2008 and FAO 2012. 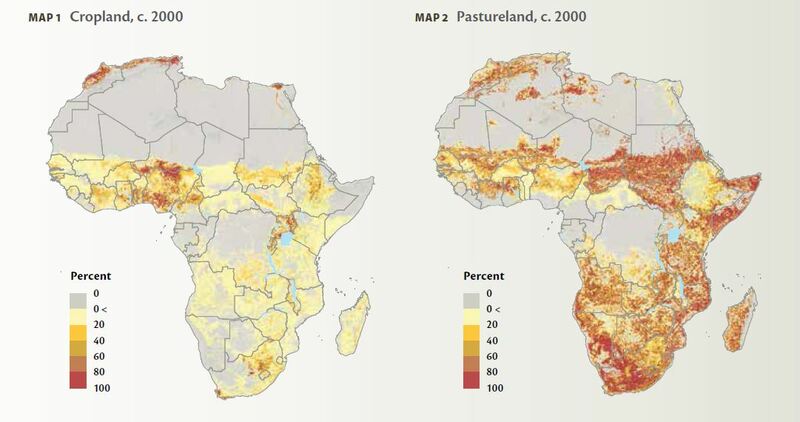 Pastureland cov­ers one-quarter of the African continent and domi­nates the landscape in the Sahel and Sudano-Sahelian regions in the west, the Maghreb, much of eastern and southern Africa, and western Madagascar. The only portions of the continent not grazed are those that are too hot and too dry, such as the Sahara, and the tropical rain forests of the Congo Basin. Cropland covers approximately 7% of the con­tinent. Western Africa has the greatest proportion at 39%. High concentrations of cropland (60≤ percent) can be found along the Mediterranean coast in the Nile Valley, Nigeria, the Ethiopian highlands, the Rift Valley north and west of Lake Victoria, and South Africa near Cape Town and north of Lesotho. Cereals are grown in all of Africa except for desert and forested areas. The cereal area is about 30 % maize, 23 % sorghum, 21% millet, 9% wheat (Maps 1–4), and 9% rice. 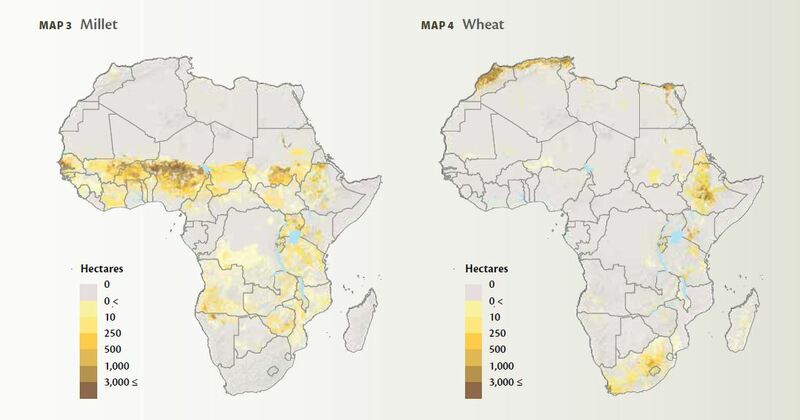 Maps 1–3 show that maize is prevalent throughout Africa and the densest areas for sor­ghum and millet, with more than 3,000 hectares per cell,1 are just south of the Sahel. 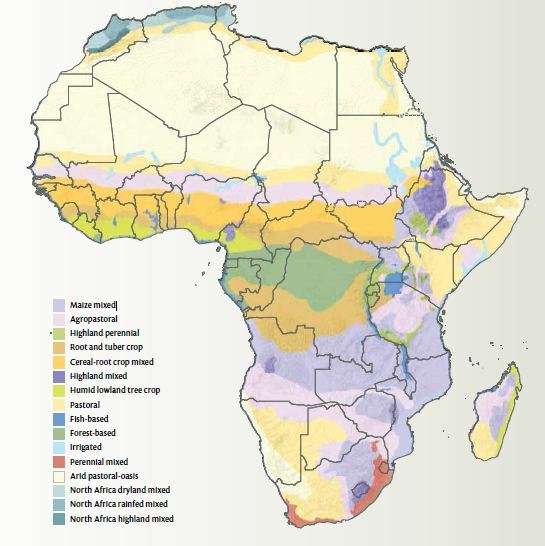 Wheat (Map 4) is grown in high con­centrations in northern Africa, with sparser areas in eastern and southern Africa. In the last 50 years, the harvested areas of maize, millet, and sorghum each doubled from a base of 10–15 million hectares to 20–30 million hectares (Figure 1).Rice areas have nearly quadrupled, from 2.8 to 9.3 million hectares. Yields have notably climbed for maize and wheat during the same period, rising from 0.7 to 2.3 metric tons per hectare for wheat and doubling from 1.0 to 2.0 for maize. Rice yields have increased by more than half, from about 1.5 to 2.5 metric tons per hectare. Millet and sorghum yields show little change (FAO 2012). Cereals account for 50% of the average daily caloric intake in Africa. Wheat and rice are particularly important, accounting for 30% and 16% of cereal calories consumed, respectively. Cereal production in Africa is sub­stantial, but it is not enough to meet demand; the continent must import about 55% of consumed wheat and more than 30% of consumed rice (FAO 2012). Understanding where half of the continent’s calories (both vegetal and ani­mal) are grown, and how intensively, is vital to increasing productivity and enhancing food security. Identifying areas where new or improved rice- and wheat-growing technolo­gies could have the most impact can also aid in making the continent less dependent on imports. 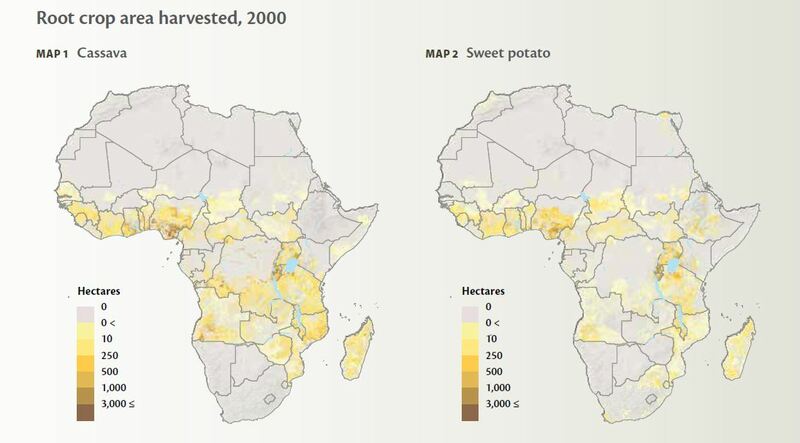 The area devoted to harvest root crops in Africa has grown significantly over the last 50 years. Cassava area has more than doubled, from 5.5 million to 12 million hectares (ha); sweet potato area has more than quintupled, from 600,000 to 3.3 million ha; and potato area has grown more than six-fold, from 250,000 to 1.8 million ha. Cassava and sweet potatoes continue to be among the most import­ant root crops in Africa, with cassava occupying about half of the root crops area and sweet potatoes about 14%. Africa needs to improve yields and the share of nutrient-rich roots and tubers in the diet of its growing population. Roots and tubers contribute only about 13 % of the calories in the average African’s diet, which is a smaller por­tion than other staples. But roots, especially cassava, are “insurance crops” that increase food security because they can be left in the ground until needed. Nearly all the sweet potato crop (85%) is destined for human consump­tion. But cassava is also important as fodder, and more than a third produced goes to animal feed. rice-growing areas, such as southern Nigeria and Côte d’Ivoire, where more than one crop harvest per year is possible. intensifying agricultural land use may be the only option. Previous research on crop productivity has focused primarily on crop yields or yield gaps and therefore strictly on the amount of crop yield per harvest. Agroecological zones are geographical areas exhibiting similar climatic conditions that determine their ability to support rainfed agriculture. At a regional scale, they are influenced by latitude, elevation, and temperature, as well as seasonality, and rainfall amounts and distribution during the growing season. The map shows the broad latitudinal symmetry of major climates and water availability north and south of the equator, disrupted by the influence of highland and lake complexes primarily associated with the East African Rift Valley that extends from Ethiopia to Mozambique. Agricultural climate zones represent ecological conditions farmers face based on moisture availability, length of growing period, and seasonality. Zones with little seasonal variation in temperature and in wet conditions are primarily found in central Africa whereas the northernmost and southernmost countries experience high temperature seasonality and arid conditions. This map provides information not only on what growing conditions these agricultural climate zones present, but also on the relative size of each zone. In some countries the climate zones are quite large, such as in Mali or Niger where the weather is homogenous across large areas. In other countries, such as Kenya or Ghana, these zones are much smaller as agricultural systems face more diverse climates across space due to topography,proximity to the coast, and/or rainfall variation. between the diversity of practices for similar agricultural systems within the larger agroecological zones, primarily in terms of different climates. A map of agricultural climate zones is a tool that can help scientists, governments, and businesses determine the best areas to boost production or focus investment.